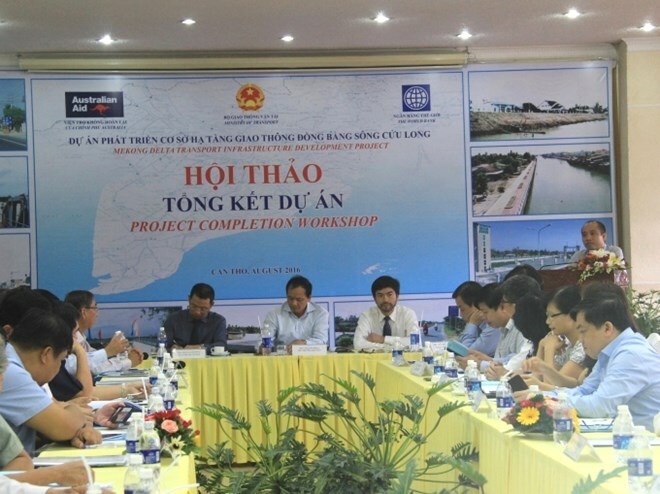 Can Tho (VNA) – The Ministry of Transport and the World Bank (WB) co-organised a ​workshop to review the completed Mekong Delta transport infrastructure development project (WB5) in Can Tho city on August 10. Speaking at the event, General Director of the ministry’s Project Management Unit of Waterways Le Huy Thang said a large number of works for the WB5 project have been completed to enhance trade with lower logistics costs through the alleviation of key bottlenecks on main waterways and inland transport corridors in the Mekong Delta region and by improving the capacity of transport administration bodies in managing multimodal transport infrastructure. The WB-funded project has significantly improved the transport connection between urban areas and those where poor and ethnic minority groups are living, as well as between Ho Chi Minh City and provinces in the region, Thang noted. He went on to say that it has contributed to the regional economic development and the improvement of living standards in areas where the project was carried out. Deputy Minister of Transport Nguyen Nhat added that the project has helped improve inland waterway infrastructure, including No.2 and No.3 waterway corridors and inter-provincial roads. According to the Ministry of Transport, the WB5 project was implemented in Ho Chi Minh City and 13 Mekong Delta provinces from 2007 to 2016.